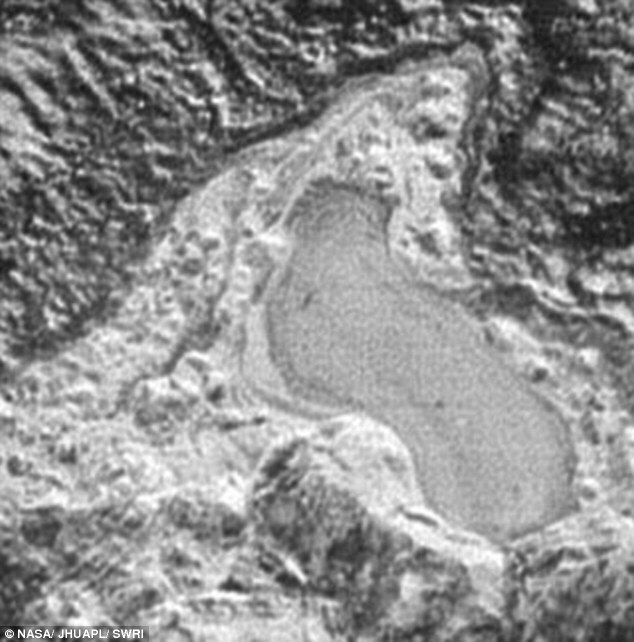 It is a frozen lake in the Ruach Planitia region of Neptune’s Moon Triton: an incredibly distant, dark and desolate world. 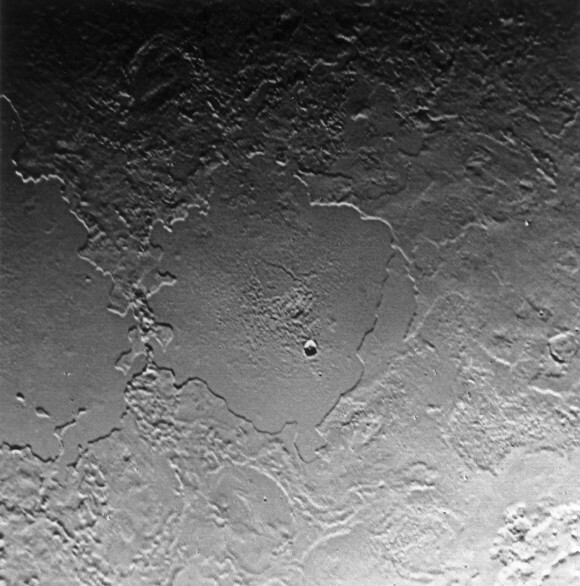 That, ladies and gentlemen, is a large (about 30 km) frozen lake (most likely frozen nitrogen), in the Sputnik Planum region of the planet Pluto. Who would have thought that Pluto, the recently demoted ex-planet, a frozen world at the edge of the solar system, would have such complex climate and such a fascinating geological history? Not sure how it happened, but it appears that I was a successful political animal today. Kevin McCarthy, House leader in the U.S. Congress, held a question-and-answer session on Quora today, and my question (about Obama’s SCOTUS nomination) turned out to be the top question, which he answered first. Not sure if that is a good thing… after all, I remember all too well the saying, “it’s better to be unknown to the gods than to be loved by them.” Predictably, the answer was a party line answer with very little information content, but still. 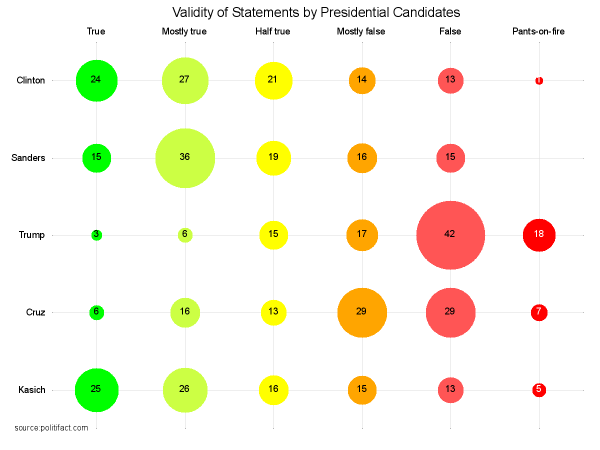 Tempting fate a little further, I also created an updated version of an infographic that compares the truthfulness of presidential candidates. Despite her reputation as untrustworthy, and much to my surprise I admit, Hillary Clinton is still pretty much on top (same number of true/mostly true answers as Sanders and Kasich, but fewer untruths). Not that this will stop Trump’s supporters from voting for him. They’ll just declare Politifact biased and full of lies or whatever. Today is a remarkable day. I spent more than the usual amount of time peeking at either CBC Newsworld or CNN, and I have yet to see the face of a certain American real estate magnate turned reality TV show host turned politician; not that I particularly miss the sight of his toupee. The reason why Mr. Trump didn’t appear on screen is the multitude of other things happening. 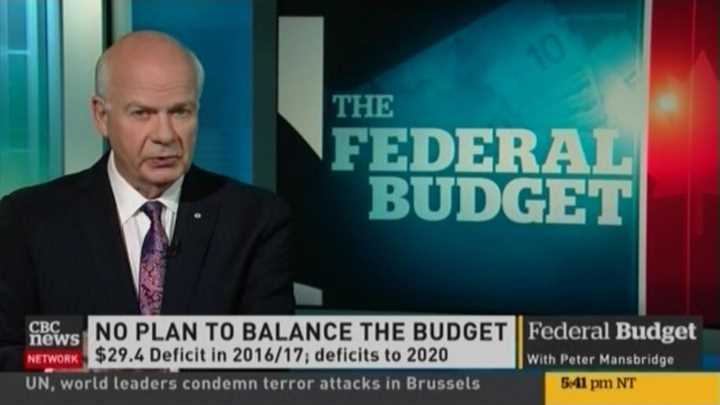 For us here in Canada, the most consequential news are the federal budget, the first by Justin Trudeau’s recently formed liberal government. As promised, it’s a budget about spending and spending some more; the projected deficits are huge. The premise of this budget is that deficit spending is necessary in order to help the stagnant economy. News of the budget were almost dwarfed by news of the death of Toronto’s larger-than-life former major, Rob Ford. Rob Ford was intensely disliked as a politician, but I think few people wished him to die a miserable death from a rare form of cancer. As Ford himself said, his tenure as major, for better or for worse, will be remembered. Then there is, of course, that terrible series of coordinated attacks in Belgium, with dozens dead. In addition to an impotent, and likely excessive response by inept authorities (I just saw that the airport in Brussels will be shut for three days), it will also likely trigger a new wave of islamophobia, xenophobia. A message that, thankfully, has few followers in Canada, as splendidly evidenced by the negative response in Quebec to French far-right leader Marine Le Pen’s visit, which is coming to its conclusion. What was supposed to be the big news of the day is the end of another politician’s trip abroad, namely Barack Obama’s historic visit to Cuba… but the CNN anchors broadcasting from Havana are talking mostly about the Brussels attacks and their aftermath. The other big news of the day was supposed to be the “winner-take-all” Arizona caucus… but with all the other stuff going on, I have not yet heard this mentioned on CNN or CBC Newsworld today. Thus, no Donald Trump on my television screen either. All this news makes me wonder if The Globe and Mail tomorrow might end up being published with not one but maybe three consecutive cover pages. Recently, it was proudly announced that Canada now has a state-of-the-art emergency preparedness system, with the participation of major telecommunication companies like Bell or Rogers. This is what was on my television screen a little earlier this afternoon, in place of CNN, for something like a full minute or so. And not just in place of CNN. In place of every channel. Even if I was trying to watch a recorded show on the PVR. What’s wrong with it, you ask? Well, I live in Ottawa. 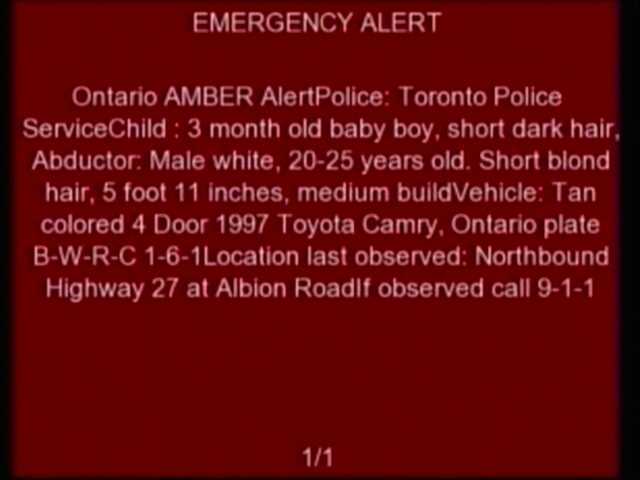 That is more than 400 kilometers from Toronto, and the last time I checked, a 1997 Toyota Camry is not a hypersonic jet aircraft. The last time this happened, I wrote to the CRTC, who told me that it’s not their responsibility (even though they were the ones who mandated it!) but that of provincial agencies and the telecommunication companies that implement the system. Today, I wrote to Rogers. I do not expect a meaningful reply*. As if I didn’t already have enough incentives to cut the cable. *Update: A day after I sent my e-mail complaint to Rogers, a gentleman by the name of Aaron called me from the “President’s office”. He very patiently listened to me as we discussed not just the emergency alert system but also other issues related to the digital transition, the cost and limited choice of decoder equipment, and other topics. We spent more than 20 minutes on the phone. I still don’t expect anything meaningful to happen, but I appreciated it that my complaint was taken somewhat seriously. When I entered the shop, I noticed that it was under renovation. But the sign said that it was open! In fact, it was a brand new electronic sign that advertised the business hours. I didn’t see a soul in sight so I hollered, “hello?” and a young, brown-skinned man soon emerged. He assured me that the shop was indeed open for business, so I made the requisite leap in logic and realized that Michel, the old barber, must have retired after all. I asked the young man if he was going to be my new barber. 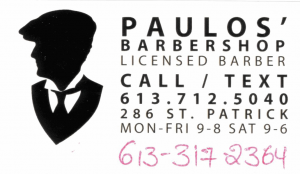 Soon, I learned a little bit about Paulos the barber. He came to Canada from Ethiopia about five years ago with his brother. Since then, they managed to sponsor several family members. Paulos is a lean, tall 41-year old man, though he looks much younger. He told me that he found the shop advertised on Kijiji and decided to go for it. He told me of his plans to hire 2-3 additional barbers, and create a much more welcoming shop with Wi-Fi and a coffee machine. I took a closer look at his hours: He is keeping the shop open, for now all by himself, from 9 AM until 8 PM every weekday, and until 6 PM on Saturdays. Meanwhile, Paulos finished my haircut. When I asked him how much I owe, he told me that it’s whatever I used to pay Michel. So I paid the same amount, with tip, that I used to pay. As I left the barber shop, I was shaking my head. Damn immigrants, I thought. They have the audacity to come to this country in search of a better life. And the cheek! Never mind making a living, working extra long hours, they actually plan to create jobs! How dare they. And the cultural rift. It is hard to find a pair of countries more culturally different than Ethiopia and Canada. Yet he has the chutzpah to do this… finding his place in Canadian society, taking over a business from a retiring French Canadian gentleman and daring to be successful. What a horrible thing that these immigrants are doing. What hubris… instead of being on welfare and being a burden on society, they dare to make this country better, enrich it with their hard work, contribute to its colorful multiculturalism. It is absolutely intolerable. Just what is this place coming to? Yet another chapter from the playbook of the late Weimar Republic: Even as he calls Bernie Sanders a “communist”, Trump now blames his political oppositions, supporters of Sanders and MoveOn.org among them, for the violence, the “planned attack” that erupted in Chicago last night. 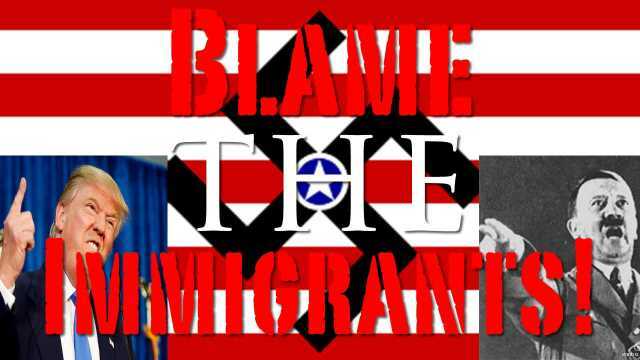 Which reminds me strongly of how the NSDAP presented itself as the party of law and order that would end the by then rampant violence between NSDAP supporters and communists on the streets of Germany in the early 1930s. To his credit, Republican candidate Marco Rubio I think understands this. What Rubio said in the minute or two preceding this comment is also worth watching. 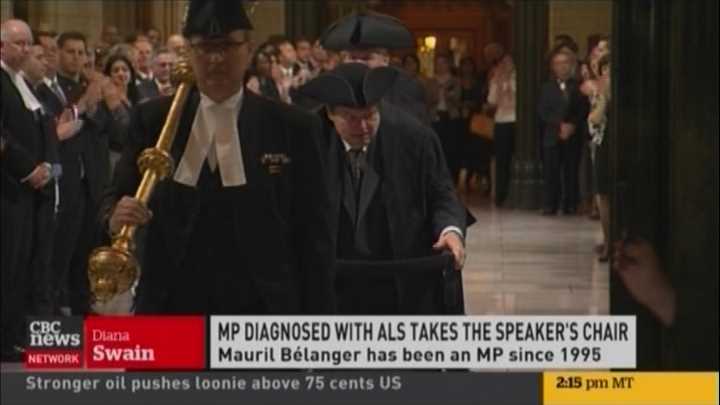 Our long-serving Member of Parliament, Mauril Bélanger, was the recipient of an unprecedented honor today: He was named honorary Speaker of the House. Unfortunately, we could not hear Mr. Bélanger speak. That is because he is suffering from ALS, or Lou Gehrig’s disease (its most famous sufferer alive is the physicist Stephen Hawking), which is rapidly progressing; since his initial diagnosis last fall, he lost the ability to speak, so it was his iPad that was speaking for him. The illness also ended his dream of becoming Speaker of the House, which explains the honor that has been bestowed on him today. I have a lot of respect for Mr. Bélanger. Over the years, I wrote to him a few times with my concerns, and on more than one occasion I received a personal response, either in the form of a latter or, in one case, in the form of a telephone call. 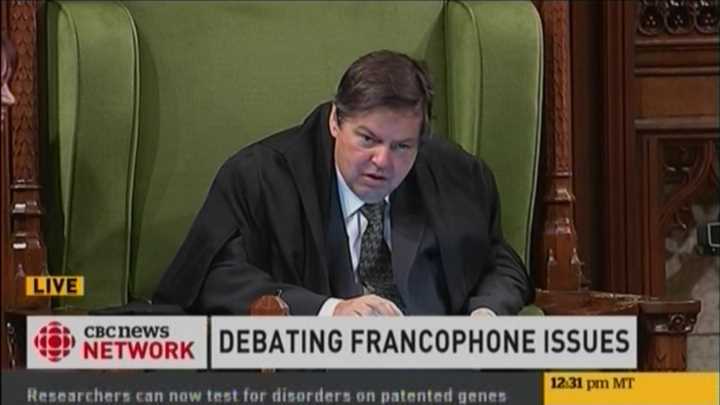 In short, Mr. Bélanger appeared to take the idea of representing his constituents very seriously. He may have lost the ability to speak but he has not yet lost all his mobility. Although he needed some help, he was able to walk into the Chamber on his own two feet. It was a moving moment, and I am glad I caught it on the CBC. Thank you, Mr. Bélanger. These signs are ridiculous. You don’t see them often in democracies; they were very frequently encountered in the former Soviet Bloc. Which once made me wonder… all a Western spy had to do was to drive around the country and mark the location of No Photography signs in order to get a fairly accurate map of all the communist regime’s sensitive installations. 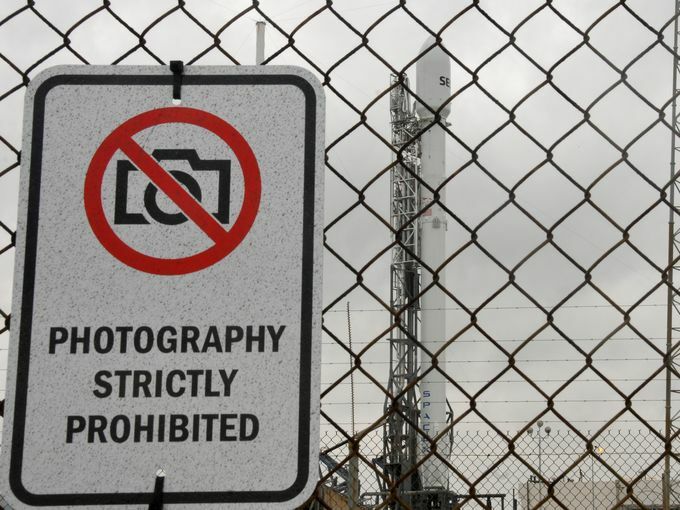 In the era of the ubiquitous smartphone with HD camera, not to mention more advanced gadgets like Google’s Glass or even toy drones with HD video, these signs are pitifully pointless. I always wondered what it must have been like to live through the rise of fascism in Europe, especially in the early days. Most didn’t recognize the danger. Many applauded. A few were concerned, but they were seen as panicmongerers or worse, maybe as communists, Bolshevik collaborators, traitors. And now I am beginning to understand what it must have been like to be one of those Cassandra-like souls. The far right in Europe is applauding. “Si j’étais américain, je voterais Donald TRUMP,” tweets Jean-Marie Le Pen, founder of France’s far right National Front party. “I hope Donald Trump will be the next US President,” chimes in his colleague from Holland, Geert Wilders, who founded the Party of Freedom. People in my country of birth, Hungary, who cheered their prime minister when he erected a razor wire fence along the country’s southern border to keep refugees out, now feel vindicated when they hear Trump talk about a wall along the US Mexico border. Where will this end? Just how far will the world go this time? Lest we forget, in the 19th century, Germany was the center of European civilization. The center of culture, music, and science. The country that gave us Gauss, Beethoven, Einstein, Kant or Goethe. Perhaps the most important lesson of Germany is that none of it matters: A horror regime backed by populism and the ideology of fear and hate can arise anywhere. We have lived mostly in peace since 1945. And those of us lucky enough to have been born in Europe or North America, in unprecedented freedom and prosperity. There are no guarantees that this will last forever. History has not come to an end; we are living it. And every time I see Trump on CNN, ever time I watch Trump give another election speech, I shudder. Is this it? Is this how Mussolini, Franco, Hitler and others rose to power? Especially Hitler… who, let’s not forget, was Germany’s democratically elected and appointed leader when he assumed the chancellorship on January 30, 1933. And lest we forget, most of those who supported these horrific regimes denied that they were supporting hate or racism. In fact, they probably rejected any such insinuation indignantly. They weren’t racists… they are trying to defend their nation! Protect its values! They were the smart ones who recognized an existential threat to their culture and way of life; others, who failed to see the coming end of civilization every time they saw a Jewish child were naive fools. I don’t usually engage in overused comparisons with the Nazis and fascists. But this time, I think the concerns are warranted. Our world is no longer following a path towards greater freedom and more respect for human rights. 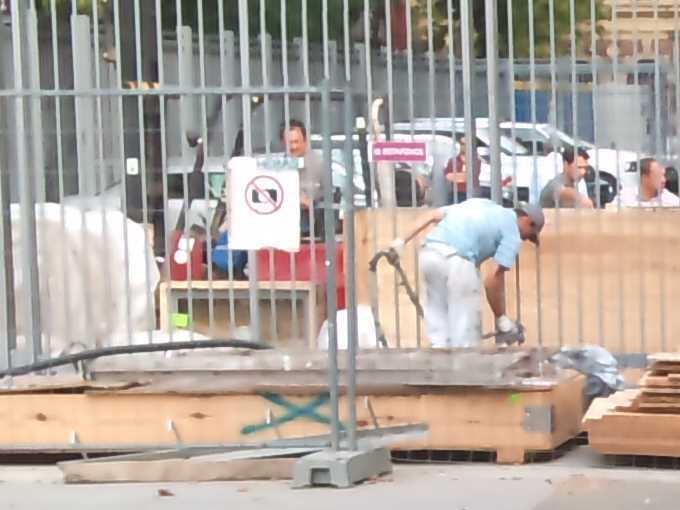 Walls and fences are being erected everywhere. States once famous for their liberalism are cracking down in the name of fighting terrorism. Europe, which once celebrated the vanishing of internal borders, is in the process of rebuilding them. And the really scary part is… this is what the people want. These measures are popular. Politicians who go against the tide, like Angela Merkel, who promised that Germany would accept as many refugees as it can, are embattled. The nationalist right is rising everywhere. Canada bucked the trend for now, but who knows what happens if Mr. Trudeau loses the next election and the Conservatives return with a vengeance, as the left remains divided. Know what? I hope I am wrong. I hope I have succumbed to hype and that my views are detached from reality. I hope that Trump doesn’t get elected, or that if he does, he will turn out to be just another crooked and pragmatic politician, one who keeps few of his election promises and one who is more interested in getting re-elected than in plunging the world into some abyss. Unfortunately, if I am right, it will be too late. I’ve never been happier that my wife and I were not blessed with children. As we are getting older, we have less and less to worry about. As we have less at stake, we can more and more afford to be just spectators, watching a spectacular train wreck. It’s not like there’s anything we can do about it. I was watching the news this morning. Including the weather. And then I double-checked my calendar, wondering if I perhaps became delusional: Is this really March, or is it still January? Then again, tonight supposedly it’ll get even colder.